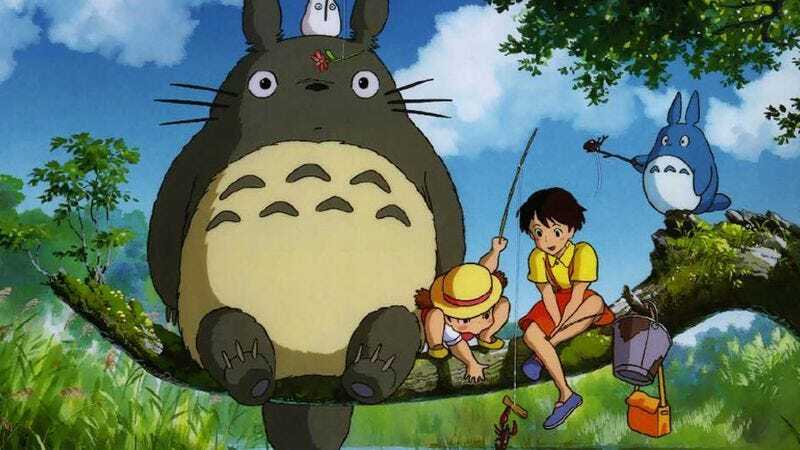 For those who have fallen under Ghibli’s spell, it’s difficult to choose a favorite, but for the uninitiated, the obvious starting point is 1988’s My Neighbor Totoro, which perfectly encapsulates the beguiling mystery of Miyazaki’s films. The story is simple: 9-year-old Satsuki and her little sister Mei move to the country with their father to be nearer the hospital that houses their ailing mother. They pass their time investigating the surrounding woods, which turn out to be full of all manner of magical creatures, including a round, fuzzy forest spirit Mei names Totoro, in imitation of its earth-shaking voice. (Miyazaki compares the creature to an owl or a bear; it also resembles a plump, neckless rabbit.) But as is often the case in Miyazaki’s films, the plot is only a pretext to explore a magical world, sometimes located right under the noses of inattentive grownups. Wait by a bus stop long enough, and the mundane forms of public transport will be replaced by a sentient, many-legged, cat-shaped bus whose route quickly leaves the earth’s surface behind. Now enshrined as Studio Ghibli’s mascot, Totoro is an iconic (and, inevitably, marketable) character. But Miyazaki never cedes the film to his non-human creations. Rather than standing in for the magic of the natural world, Totoro merely embodies the qualities already present in the sisters’ surroundings. There’s as much enchantment in ordinary activities, like the girls chasing each other around the house, as in any flight of fancy. My Neighbor Totoro has its roots in Miyazaki’s own life—his mother was hospitalized when he was a child—and the movie is informed by the texture of memory, so reality and imagination become indistinguishable. In Miyazaki’s films, the characters are rendered in cartoon fashion, but the world around them is painted in more realistic hues, more closely resembling an impressionist painting than a comic strip. The evident care with which Miyazaki depicts the texture of a clump of grass or a tree is a subtle but persistent reminder of one of his great themes: the power and fragility of the natural world. In Princess Mononoke, his ecological bent crystallizes into an environmentalist parable, but it also has deep roots in Japanese tradition, where seemingly inanimate objects like rocks and trees are inhabited by living spirits. Princess Mononoke was Ghibli’s beachhead in the U.S., the movie that got the studio the mainstream recognition and theatrical audiences it deserved. (For a glimpse at the bad old days, seek out the dubbed, panned-and-scanned Fox DVDs of Totoro and Kiki’s Delivery Service—or, better yet, don’t.) With an English script by Neil Gaiman and a high-profile voice cast, it seemed poised for a Stateside breakthrough. Though box-office returns in the U.S. were modest—and a drop in the bucket compared to those in Japan, where it was the highest-grossing film in the country’s history until it was dethroned by Titanic—the notion that Studio Ghibli made animated films that culturally literate adults could attend without a pint-sized companion as pretext had been firmly planted in the nation’s mind. In the context of Miyazaki’s other films, Mononoke’s story of a wandering warrior who gets caught in the battle between an angry forest spirit and a mining town seems slightly ponderous, and a tad too aware of its own epic scope, but it is undeniably a majestic work, a lyrical vision with metaphorical weight. While it’s a blessing to have nearly all Ghibli’s features available on DVD in the U.S., it’s clear that Disney still thinks their primary audience is children, which is presumably why it’s never released the adult-themed Only Yesterday and Ocean Waves. Fortunately, Isao Takahata’s Grave Of The Fireflies is excluded from Disney’s holdings, which allowed Sentai Filmworks to bring the sobering film back into print earlier this year. Although the movie’s protagonists, 14-year-old Seita and his 4-year-old sister, Setsuko, are children, the film is hardly fit for preteen audiences. Even adults may find the story of a boy and his sister trying to fend for themselves amid the rubble of immediately post-World War II Japan difficult to endure, at least without shedding copious amounts of tears along the way. While Miyazaki often approaches the same themes from different angles, Takahata is Ghibli’s wild card, an inventive, versatile craftsman whose talents lend themselves to a wide range of approaches. Grave Of The Fireflies is part memoir and part ghost story, beginning with Seita homeless and near death, his only apparent possession a small tin full of ash and bone fragments. Where Totoro uses animation to envision a world that doesn’t exist, Grave uses animation to tell a story that would be unbearable in a more realistic medium. The opening scene foreshadows the inevitable tragedy, but that hardly makes the sorrowful forward march of time easier to weather. Even amid the ashes of a defeated, disheartened nation, though, Takahata finds moments of beauty, like the incandescent insects of the film’s title. But few films, animated or otherwise, have the courage to pursue such a bleak, fatalistic view of the world, to say nothing of one that so determinedly casts its native country’s past in such a dour light. The breadth of Takahata’s sensibilities becomes clear a few frames into Pom Poko, which is as rich and complex a fable as any of Miyazaki’s more familiar works. The film’s protagonists are the tanuki, a race of raccoon tricksters familiar from Japanese mythology. With a story that pits the manmade destruction of the tanukis’ natural habitat against the species’ out-of-control overpopulation, the movie roughly parallels Miyazaki’s environmentalist concerns. But the tanuki are hardly a benevolent or wise race. In a bid to stop the development of Tama New Town, an enormous housing development built outside Tokyo in the mid-1960s, the tanuki use their shape-changing abilities to infiltrate humankind and cause sometimes deadly mischief. As they watch the news on a trash-picked TV set, the tanuki cheer a delay in construction, their cries drowning out the announcement of several human deaths. The historical setting means the tanuki are doomed to failure—Tama New Town, which houses some 200,000 Japanese, will be built no matter what they do—so the film isn’t the story of underdog triumph so much as a referendum on the tanukis’ character, and that of their human counterparts. Both are found wanting. Miyazaki’s films are characterized by their artistic discipline, but Takahata’s is a more protean, unpredictable gift. Like the tanuki themselves, Pom Poko frequently shifts form, depicting the ravages of construction by picturing bulldozers as pests eating away at a leaf, or interrupting the fluid animation with a sequence in the style of an 8-bit videogame. Only Yesterday, never released on Region 1 DVD, is similarly slippery in its shifts between past and present, moving between the life of a disillusioned 27-year-old Tokyo woman and her memories of her childhood. The film’s vision of the past is more bittersweet than nostalgic, befitting a director who rarely gives in to unbridled sentiment. My Neighbors The Yamadas, Takahata’s final feature to date, is an oddity even for him. Adapted from a popular comic strip, the film takes on a similar style, with two-dimensional characters presented in a sea of white space. The only Ghibli film to be produced entirely with digital technology, it lacks the fluidity and grace of the studio’s hand-drawn efforts, and the episodic narrative is only fitfully satisfying. That said, it’s rare to find a film so squarely focused on the familiar ins and outs of family life, and there’s a low-key charm to its ebullient vignettes, although even at its best, it feels like a well-crafted sitcom. Miyazaki’s features split, very roughly, into two strands, indicated by their protagonists’ age (and, less exactly, gender). The fables, which include Totoro, Kiki’s Delivery Service, Spirited Away, and Miyazaki’s most recent feature, Ponyo, are episodic in form, concerned with delineating a world and defining the characters, mostly preteen girls, through their understanding of it. The adventures—Howl’s Moving Castle, Princess Mononoke, Porco Rosso, and Castle In The Sky (a.k.a. Laputa)—are oriented around conflict, generally featuring older male characters in the lead. Miyazaki’s films overlap to such a degree, and are of such high quality across the board, that differentiating between them is difficult and not especially desirable. Kiki’s Delivery Service ranks second only to Totoro as a blissful children’s adventure, a lighthearted story of an apprentice witch who puts her talents to good use. But for Miyazaki, the boundaries of childhood are always porous, and encompass subjects that many present-day filmmakers (and parents) consider beyond young viewers’ ability to assimilate or comprehend. His movies are truer to the way children understand the world, as well as to their impetuous, irrational, sometimes-petulant selves, than the imaginary innocents who are the target audience for most diluted, denatured kiddie entertainment. Following a girl named Chihiro into a bathhouse for wayward spirits, Spirited Away is poised between the relatively carefree world of childhood and the dangerous territory of adult life. The world Chihiro encounters—looking for her parents, who have been turned into pigs—is full of wonder and danger as well, notably a witch named Yubaba who evokes John Tenniel’s Red Queen. Ponyo, a loose adaptation of Hans Christian Andersen’s “The Little Mermaid,” skews younger with its story of a goldfish (depicted as a blobby toddler) who falls in love with a human boy, but the threat of catastrophe still lurks. Ponyo’s father is a powerful sorcerer, and her actions unleash a power that could be devastating. Miyazaki is obsessed with flight, enough so that Studio Ghibli’s name comes from a WWII-era nickname for Italian spy planes. Castle In The Sky is one of many films where characters find a entire world hidden in the clouds, in this case one that takes its name, Laputa, from Jonathan Swift’s Gulliver’s Travels. A more obvious, though still highly eccentric, homage to his preoccupation with flight is the delightfully bonkers Porco Rosso, in which a WWI flying ace does battle with rogue bands of “air pirates” in the Adriatic Sea. Miyazaki’s films rarely take place in a recognizable world, let alone a specific time period, but the film’s modest realism is more than offset by the fact that its main character is a bipedal pig. Originally commissioned as an in-flight film for Japan Airlines, the film grew into a feature but retains some of the casual lightness of a short subject. Miyazaki often takes his inspiration from literature, although even in the case of explicit adaptations, the source material has been thoroughly absorbed. Howl’s Moving Castle bears little resemblance to Diana Wynne Jones’ source novel, but even she was taken enough with the results to proclaim her full support. As in many of Miyazaki’s adventures, the world is pushed to the brink of war, but here, the origins and even the nature remain unclear, as if from the perspective on the ground, it hardly matters who’s fighting whom. Miyazaki’s later films are more leisurely in their pacing, often because they dawdle to take in the texture of a leaf or patterns of light, but here, the pace is seasoned with something like dread. The studio has released a number of films by directors other than Miyazaki and Takahata, though those titles don’t entirely measure up to the work of Ghibli’s grand masters. The most recent, and one of the best, is The Secret World Of Arrietty, directed by Ghibli key animation veteran Hiromasa Yonebayashi. Loosely based on Mary Norton’s The Borrowers—though it follows the novel’s storyline much more closely than Howl’s Moving Castle sticks to its own source material—the movie follows its doll-sized heroine into the strange, threatening world of humankind, a nifty twist on Ghibli’s usual habit of placing human heroes in unfamiliar surroundings. The movie is particularly acute when it comes to representing the texture of Arrietty’s world, like the way a water droplet looks to a creature only slightly larger than it, or the booming echo of sounds that humans typically pay no mind. Less successful: Tales From Earthsea, based on the fantasy series by Ursula K. Le Guin, and directed by Hayao Miyazaki’s son, Goro Miyazaki. The visuals, unsurprisingly, are splendid, but the movie feels disorganized and uninspired, as if the younger Miyazaki was unsure whether to follow the plot of Le Guin’s saga, or simply replicate its atmosphere. Whisper Of The Heart was meant to introduce director Yoshifumi Kondô as Ghibli’s next great director, but he died of an aneurysm a few years after its release. It’s an odd hybrid, poised uncomfortably between Takahata’s Only Yesterday and Miyazaki’s whirling fantasies. The story begins in domestic mode, following a schoolgirl whose most pressing current problem is devising a workable Japanese translation of John Denver’s “Country Roads” for school. (In a playful alteration, she replaces the word “country” with “concrete,” a subtle comment on how urbanization has transformed Japanese life.) But then, almost out of nowhere, a dapper, top-hatted cat figure called the Baron shows up and starts guiding her toward her dreams. The Cat Returns, directed by Hiroyuki Morita, is an extremely loose sequel in which a girl saves a cat from traffic, and is drafted to be married to the son of the King Of Cats. In some ways, the ideas at work aren’t so different from Miyazaki’s, but the movie’s uncertain touch is a reminder of just how difficult it is to bring Miyazaki’s special sort of magic to life. Ocean Waves, directed by Tomomi Mochizuki, is a tender, acutely observed tale of a young man’s transition to adulthood, very much in the vein of Only Yesterday. The movie is likewise unavailable in the U.S., but diehards will find a way to see it, legal gray areas or no. To fill in some background, it’s also worth seeking out some pre-Ghibli features by the same talents, especially Miyazaki’s epic Nausicaä Of The Valley Of The Wind, whose success paved the way for Ghibli’s founding, and The Castle Of Cagliostro, the boisterous tale of a legendary thief that rivals some of Hitchcock’s most feather-light entertainments. Ghibli’s best-known film, and the ideal introduction for viewers young and old. The darkest film in Ghibli’s library, and one of its most moving, as well as a landmark that shatters preconceptions about the animation medium’s potential. The other side of Takahata: playful where Grave is somber, chaotic where it’s controlled. A giddy, flawless lark that reveals more serious themes as it progresses. It’s neck-and-neck with Castle In The Sky and Princess Mononoke, but it takes the edge among Miyazaki’s tales of epic struggle for the way it balances world-shaking developments and character interaction. Proof that Ghibli isn’t synonymous with Miyazaki and Takahata, although there’s certainly a wide overlap. Yonebayashi follows ably in his mentor’s footsteps by seeing our world though the eyes of a tiny protagonist, making the mundane world seem full of new wonder and fascination.